IR heaters. 120V plug- in or use two in series for a 208-240V plug-in use. Please note that the price shown is for one rod unit (the picture shows two rods). Power: Nominal 500W Max. Radiative power (from each rod). May be used for gentle air convection also- in ovens. Quartz tube enclosure as shown. Metallic ends as shown. Approximately 5 Amps Maximum Current. 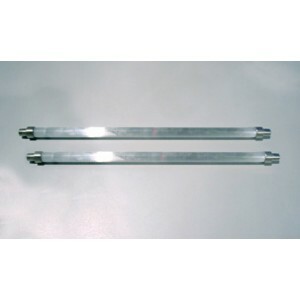 Dimensions: 12″ Long (end to end) and ~0.6″ Diameter. Temperature: Rated to 1000C on quartz tube. This is the not-to-exceed temperature. Please note that the rated supply voltage, 120V or amps, 5A or temperature, 1000C should not be exceeded for this product. Voltage Control System – VPAN 12kW.